Happy new year to everyone. Hope everyone had a happy and safe New Years Eve. We went out to dinner and then stopped by our son's house and spent a couple hours with their family. We were home and I was in bed by 10:45, where I watched the ball drop in New York at midnight (11 p.m. for me). Does that count for seeing the new year in? My mother is a New Years baby and we visited her yesterday to help celebrate her 83 birthday. She is called G.G. by her great grandkids. 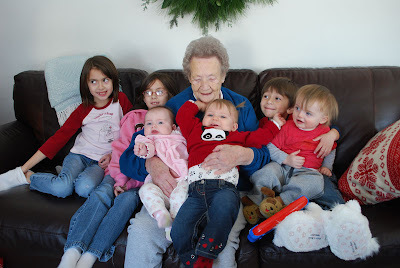 Here's a picture of her with six of her eight great grandkids. We sure wished we could have gotten the two older boys in it but they live in another state. Maybe soon!